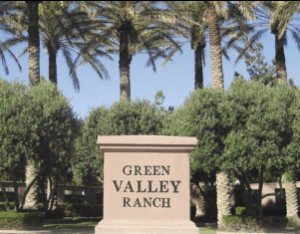 Green Valley Ranch is a small 1,300 acre tranquil community at the base of the Black Mountains just South of Green Valley master-planned community in Henderson, NV. The locals often refer to it simply as GVR. There are approximately 3,900 homes spread throughout 30 dynamic neighborhoods with plenty of posh upscale shopping venues, award winning golf courses, casual & upscale restaurants, and a business district all in close proximity. Green Valley Ranch real estate is easy to find just off the I-215 freeway and is simply breathtaking with all the tree lined streets throughout the community. Green Valley Ranch real estate is known for having some of the best schools in the greater Las Vegas area and some great amenities such as community pools, playgrounds, picnic areas, soccer fields, baseball fields, basketball courts, and neighborhood parks including Paseo Verde Park and Dos Escuelas Park. Residence also enjoy the amazing city views from many parts of GVR and also the greenbelts, walking & biking trails, and so many more lifestyle activities being so close to home. Green Valley Ranch residents also come from all over to enjoy some of the great amenities in the area including the outdoor amphitheater, Discovery Park, Green Valley Ranch Casino, The District at Green Valley Ranch , and newly finished Henderson Multigenerational Center. GVR has a little something for all ages; no wonder it remains one of the most sought after neighborhoods in the Las Vegas and Henderson area. Residential zip code is 89012.